Food containers come in handy for storing different types of food such as fruits and veggies. They are created with various types: glass, plastic, and aluminum. Most of these are designed for storing at a cooling temperature whether it be inside the fridge or in a cooler box. To choose the best food container, you must always consider the material and heating resistance. In this article, we will discuss the buying guide and the top 10 best products on the market to lift your burden of finding the right food container. We will each talk about the essentials of how to choose a food container in the buying guide section and will also present the top 10 ranking of the best items with descriptions that you can purchase online. Let’s not waste anytime and begin the search! 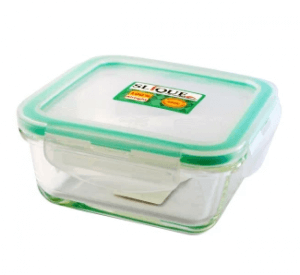 In this section, we will give the essential factors on how to choose a food container. This buying guide will help you narrow down your search for the right one. We usually think that food containers do not have resistance to heat and they are only suitable for cooling. However, many food containers on the market are already designed to be heated in a microwave. These microwavable food containers make food storing hassle-free because you can directly warm your food without transferring it to another container. If you frequently have leftovers at home that need heating, getting a microwavable food container makes it much easier. However, these containers can vary on the maximum temperature they can resist. Some can only take up to 100 °C, while others can take up to 400 °C. Depending on the type of food you are microwaving, just take note of the allowable maximum temperature of the item and always follow it for safety reasons. 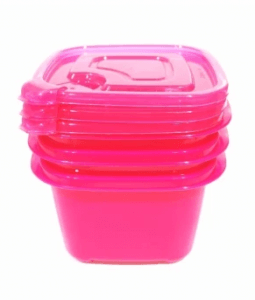 There are three different types of food container materials. The first type is plastic. Plastic food containers can be easily seen on the market because they are cheaper than the other types of material. They are also ideal for keeping foods at a lower temperature, that is, for cooling or freezing. 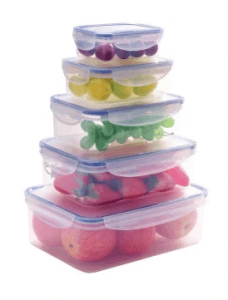 Many plastic food containers today are sold as sets, so you can enjoy a wide range of sizes to make food storing more convenient. The second type is glass. 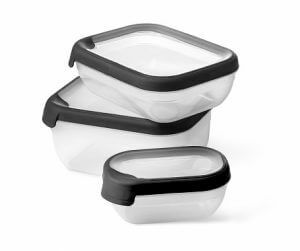 Glass food containers have high resistance to heat and are great for heating foods. The only general issue with this type, however, is the risk of tiny shards that could, by accident, end up in your food without you knowing it. So always check the edges of the glass containers to make sure everything is safe. The third type is aluminum. Aluminum food containers are lightweight and is least commonly used. They are great for storing cold desserts like mango float and maja blanca and other cold foods because they can be easily kept in your freezer. However, the stability of this material might be a disadvantage, aluminum is not hard in nature, so try to use this when you see fit. 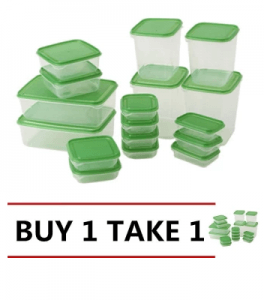 It is now time to introduce the top 10 best food containers that you can buy online. The ranking will serve as your reference in choosing which item suits you best. 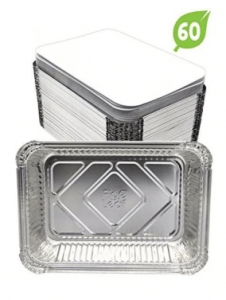 Fig and Leaf offers a 60-piece set of aluminum food container that you can share with your friends. You can cook a huge amount of your specialty dish and let your friends enjoy it by sharing the food using the containers. This is an aluminum pan set for cooking enthusiasts who want to give their loved ones the taste of joy in their cooking. Each container is made thick for better durability. The containers are also paired with strong flat lids made of a plain board, having one side built with aluminum. The set is microwavable as well for heating leftovers and other cold foods. This colorful 3-piece set food container is a go-getter for storing your favorite snacks. Each 500-ml plastic container is made compact for a neat and organized snack keeping. This is incredible for students and even families at home who love to keep their snacks nicely. You can also use these containers for smaller goods like spices and herbs, and candies and chocolates. It is handy as well, so it’s easy to carry anywhere you like. Although it is colored, the food containers are still transparent that allows you to see your goods without opening it. The set is safe for microwave heating for an even better performance. However, the food containers are only made of an ordinary plastic material, so heating over 100 °C may affect the texture of the containers. Home Basics provides a glass food container that eliminates bacteria. 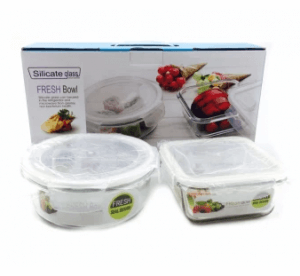 The silicate glass has an antibacterial technology that stops bacterial growth in your stored food. The set comes with two container sizes and shapes, 1-liter round and 700-ml square containers, with two lids. This is a set for everyone as it specializes in preventing contamination of your food through its antibacterial feature. Each food container has also an airtight lock system that does not allow air to pass through easily, keeping the preservation of your food longer. It’s perfect to be stored in the fridge or heated in a microwave. Please take note, however, that the containers may not be ideal in keeping fruits with large seeds, like mangoes, because it can double their weight (especially the 1-liter one), which can be too heavy. The set comes with 10 awesome meal prep containers that you can use alternately for your everyday lunch. It’s also great for preparing multiple meals at once, separating fruits and veggies from your main dish. This is wonderful for students and working individuals who prefer eating a homemade lunch. Its material is made of a food-grade plastic that promises the best quality. Each 750-ml container is lightweight that can be stacked easily in your fridge or any desired part of your home. Although the set is microwavable, it should be heated without the lid, which may cause some splatters. 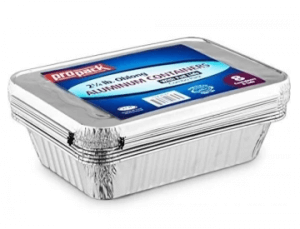 Propack introduces a set of 8 aluminum foil pans with its perfectly matched lids. The lids are built with uniquely designed hemmed edges for a tight cover. This set lets you store a good amount of your favorite cold desserts for different series of occasions and is microwavable too. This is great for dessert chefs and for people who are into creating homemade cold desserts. Each pan, which can hold up to 2 ¼ lbs, is also reusable for multiple uses and disposable for your friends to easily bring home. However, you can’t use citrus fruits in your desserts because the acidity of these fruits reacts to the aluminum material that may affect your desserts’ taste. This microwavable food container set lets you organize your foods without difficulty. It comes with 17 different container sizes that can store veggies, leftovers, and other kinds of food. This is best for families who usually stock groceries and goods at home on a weekly basis. The containers are made of polypropylene plastic that makes it durable and lightweight. The set also allows you to maximize the space in your fridge by letting you pile the containers on top of each other. You can make sure your food is securely kept in each container because its 4-side lock system assures a tight cover. This microwavable set can also store liquid foods well because it won’t allow leaks. Disturbance from food odors is removed because it can lock in the smell too. The set includes 5 spectacular containers, from large (2,500 ml) to small (240 ml), with lids. This is perfect for people who are into outdoor activities such as camping or beaching as the food, especially liquids, won’t leak even if it is shaken. 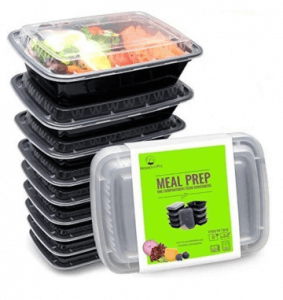 Each plastic container features a Microban technology with antibacterial and antifungal properties that prolong the lifespan of your food too. However, because its lock system is so tight, it may be difficult for you to open the container. This 40-piece food container set allows you to neatly store different types of food in a very organized way. It includes containers of various sizes that can keep 118, 296, 473, and 710 ml and 1.2 and 1.6 liters of food. 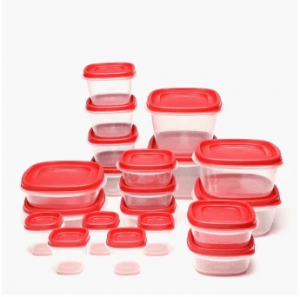 Its easy-find lids tightly fit the containers for safe storing. Each microwavable plastic container is BPA-free as well, preventing negative health effects on your body. It’s recommended for cooking moms who do the job of organizing different ingredients in the kitchen and for families who love picnics and other outdoor activities, bringing various types of food. Our number 1 on the list offers a 360-ml glass food container that is microwavable for an easy food warming. The tempered glass is made 4 to 5 times more durable compared with the ordinary glass, which makes it safe when heating. This is highly recommended for families who always have leftovers to warm up. This leak-free food container is also dishwasher-safe that has high resistance to detergents that can cause damage to it. Choosing the best food container primarily depends on when and how you are going to use it. If you are thinking about getting a food container for cold desserts on different occasions, the aluminum type is best. However, if you will use it to store foods on a daily basis, plastic sets or the glass type is perfect. Just always remember to get a food container that fits your needs. Therefore, choose wisely and practically!